After Iris is endangered by Cicada, Nora starts using time-travel to try and save the day, only to progressively make the situation even worse. Meanwhile, with the metahuman cure nearly complete, Cisco takes a night off for a date with his new friend, the bartender Kamilla. If Ralph was at his office when Cicada attacked Iris the first time, why wasn't he the first one there when Iris' panic alarm was activated? Really, how many more times is the team going to take down Cicada and then just stand there as he gets away? Just dog-pile him and put the meta-blockers on him! Honestly, the most unforgivable aspect of this episode is they didn't go with the much better title of Run, Nora, Run. The effects work and transitions as Nora runs back in time is rather nice. Nora attempts to change the past 52 times. This is yet another repeated use of the number 52, which, as has been noted before, is a number of some significance in the DC Comics Universe. Cisco says that he doesn't have to dress like Ozone to impress Kamilla. This is a reference to the movie Breakin'. The metahuman cure requires one month to fully synthesize. Sherloque suggests the Speed Force might be used to enhance the synthesis process. All compounds are formed by a catalyst and the most efficient catalyst for a compound that negates dark matter is super-luminal particles like tachyons. Since the densest tachyons in existence lie inside The Speed Force, a trip with the metahuman cure through the heart of the Speed Force should prepare it in the span of an hour. Cicada's dagger is revealed to allow him to detect nearby metahumans. This allows him to find Ralph in the office across the hall from Iris' office, when Cicada goes looking for Iris and she isn't there. When Cisco is lying about what kind of workouts he indulges in, he mentions pilates for the core, plyometrics for the quads and circuit training along with finger push-ups. Nora: I don't think so. Ralph: Great! I get another chance at this. Barista 1: One Zoom and one decaf Flash. Cisco: And I think I have to go. Cisco: No. (pointing to his phone on the table) Right... now. Cisco: (sadly) Yep. Gotta go. (getting up) Umm - I'd ask if we could have a do-over, but, um, something tells me we already have. Barista 1: The men in this city. Barista 2: Tell me about it. Cisco: Nora, sometimes we fail because all we worry about is not failing. Cicada: You said you were going to beat me, but tonight... (growling) I'm going to beat you. All of you. Cisco has started looking at Kamilla's photos on-line in anticipation of their date. He worries she might be too good for him. Nora refers to Barry having to stay in the Pipeline for 24 houirs in 510 and Iris' encounter with Cicada in 513 to persuade Barry not to go into the Speed Force alone right now. Ralph has written a companion book to The Book of Ralph from 502 called The Book Of Love. It follows up his 27-step plan for getting over a bad-breakup with a blueprint for approaching a first date. The book includes chapters on Initial Planning (Chapter One), Knowing Your Terrain (Chapter Six) and Intelligence and Reconnaissance (Chapter Thirteen). This last step involves looking at her public profile on social media and determining what kind of men she has been interested in in the past. Caitlin and Sherloque excuse themselves to finish working on the injection device for the metahuman cure. Iris goes back to her office to work on a story. At 8:27 PM, Iris is knocked out by Cicada. There is a drink called The Cicada at C.C. Jitters. Based on a picture of Kamilla with some guy in a suit and slicked-back hair, Cisco shows up for the date in a suit with slicked back hair. Cisco tries to play the suave businessman but only comes off as a conceited prick who profits off of other people's work after Kamilla asks why he wears a business suit in the lab (remembering his using science terms when they first met in 512) and he lies about working for Ramon Industries. Kamilla's drink of choice is a Decaf Flash. Cisco's drink of choice is the Zoom. When Cisco gets Iris' alarm warning, he asks Kamilla for a raincheck. She doesn't even say goodbye as she leaves. Iris' alarm sounds at 8:52 PM. 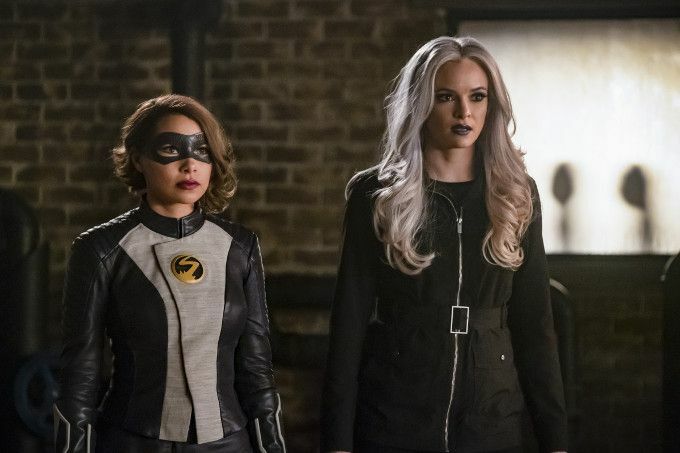 Cicada throws his dagger in a long arc and commands it to hit Killer Frost in the back when it comes back to him, having seen XS and Killer Frost coming. Nora runs back in time to just as Ralph was arriving at STAR Labs with The Book of Love. Sherloque seems to recognize something is wrong when Nora comes back the second time. Nora persuades Iris to stay at STAR Labs on her second time around. This time, without Nora in the lab to watch Cisco as he is looking through Ralph's photos of Kamilla, this time he sees one of her being lifted up by a large, sporty-looking fellow. Cicada goes to Iris' office but she isn't there. This leads to him sensing Ralph, who is across the hall in his detective agency, and Cicada knocking Ralph out. This time, he recognizes Ralph as Elongated Man but otherwise gives the same speech about beating all of Team Flash tonight. The second time, Cisco shows up for his date in a t-shirt and ball-cap. He tries to play the part of a gym rat, but Kamilla said she thought he was the kind of guy more concerned with flexing his mental muscles than his physical ones. This second time, Cisco touches Kamilla's hand as they reach for the same drink instead of being stopped by the barista. He vibes the baristas making derisive comments about his not knowing a decaf from his own drink by looking and how the men in Central City are idiots. Once again, Kamilla leaves when Cisco asks for a do-over date, without saying a word. The second time, Raph shouts a warning about Cicada's dagger and Nora moves Killer Frost out of the way, only for Ralph to be stabbed by Cicada's dagger. The third time, Sherloque definitely seems to think something is up with Nora but says nothing. Nora convinces Iris to stay and write her article at STAR Labs and convinces Ralph to stay and try some of the brownies she has in the lounge. Nora encourages Cisco to look at Ralph's collection of pictures of Kamilla. This time, when he handles them, he vibes Kamilla saying that she thought he was a man who flexes his brain rather than his muscles from the second time Nora time-traveled. Sherloque also seems to notice Cisco's odd reaction, which Cisco describes as deja vu. It is 8:07 PM when Cisco leaves for his date the third time. The third time, Sherloque goes to Iris' office and is ambushed by Cicada at 8:27 PM. The third time, Cisco shows up for his date looking like a male model and claiming to be a social media influencer. He gives Kamilla a business card. This time, when he touches her hand, he vibes her saying that the last time they spoke he was talking about genomes and DNA so she assumed he was a scientist. The third time, Kamilla orders their drinks instead of Cisco. This time, Nora goes in to face Cicada alone, not taking Caitlin with her. Unfortunately, being Cisco left his date earlier, he gets there just in time to get stabbed in the back by Cicada before Nora gets there. The fourth time, Nora takes everyone into the lounge and tells them they have to stay there for one hour. The fourth time, Cisco vibes Ralph showing him the photos he took from Kamilla's profile and the details from his previous dates about what kind of man she thought Cisco was. The fourth time, Cicada breaks into Iris' office and finds a picture of Iris with Joe and Cecile. The fourth time, Cisco texts Kamilla and says he won't be able to make their date because of a problem at work. The fourth time, Cicada takes Cecile Horton hostage and she is stabbed with the dagger before Nora arrives. This leads into a rapid fire montage where everyone dies again, several times, in different ways, with Ralph in costume as Elongated Man dying at one point. Nora tries entering into the Speed Force to find her dad and get his help, but she can't do it for some reason. She also can't go back to before Barry entered the Speed Force. After 52 attempts, everyone figures out that Nora is reversing time. Ralph says this may be one of the fixed points that The Legends theorized and that there's no way to alter things so that nobody dies. Cisco tells Nora about how he once died in an alternate timeline in 115. Nora has seen both Breakin' movies. Team Flash finally breaks the chain by having Iris lure Cicada to the roof. He throws the dagger as he sees XS approaching, at which point Vibe, Elongated Man and Killer Frost arrive. Vibe creates two portals as Elongated Man stretches his arm and Killer Frost ice blasts toward Cicada. The dagger almost hits Ralph, but it goes backward as Nora reverses time. She uses Elongated Man's arm as a dragline and runs through Killer Frost's blast, which slows her down enough to steer her way throubh one Vibe portal and out the other. This lets Nora push Cicada into the path of his own dagger. He is still somehow able to super-jump away. This time, when Cisco goes on the date, he is himself, doesn't lie, is honest about being a tech guy more than a scientist but the passion with which he speaks about helping people with his new project hooks Kamilla's interest instantly. He also calls their orders ahead and says he just had a feeling about what Kamilla would like. This time the baristas speak of him with approval, saying he's not like most of the men in the city. This time, Cisco asks for a do-over and Kamilla agrees. Barry is stunned when Nora tells him about how she traveled in time 53 times trying to fix the situation. He gives her the same speech Jay Garrick did in 302 using a broken coffee cup as a metaphor for time. He also tells her that no one can account for how things can be changed by a trip through time. This stuns Nora, who seems to have been told differently. Nora goes back to 2049 and asks Thawne is he is sure he knows what he is doing. He angrily insists he is the only speedster who knows what they are doing before assuring Nora that if she follows his instructions, they can defeat Cicada, destroy his dagger and save her father. A decent enough filler episode, though Cisco's attempts at playing someone else to impress his date reek of the Idiot Ball and don't jibe with Cisco's usual empowered nerdiness. Still, the effects work is great though Legends of Tomorrow really did this storyline better twice with Here I Go Again and Legends of To-Meow-Meow.